Roberta and I were having lunch today in our favorite BBQ joint (Cafe Pig in Peachtree City, Georgia). As we were talking I looked up at the bric-a-brac on the wall and noted a copy of a painting of Franklin Delano Roosevelt. It was the painting that was being worked on the day of his death in Warm Springs, Georgia – April 12, 1945. Unfinished Portrait of FDR by Elizabeth Shoumatoff. 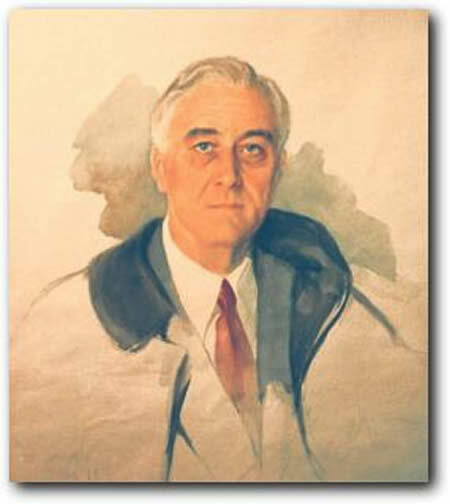 FDR was sitting for this portrait at Warm Springs on April 12, 1945 when he complained of a terrific headache and then collapsed. He died later that day of a cerebral hemorrhage. A copy of the painting still sits in an artist’s easel in the living room of the Little White House, as though waiting for the subject to come back to finish the sitting. Roosevelt was a blue blooded patrician from the Hudson River Valley, a member of an extensive family that traced its roots back to the earliest Dutch and Huguenot settlers to establish a foothold in the New York region. One of his cousins, and his personal hero, was Theodore (Teddy) Roosevelt, Assistant Secretary of the Navy, commander of the Rough Riders in the Spanish American War, Governor of New York and later the 26th President. Born into privilege and wealth and blessed from birth with family connections that could have carried him anywhere in the Republican political world, FDR chose instead to run as a Democrat. In his first political foray in 1910 – a run for New York State Senator – he sensed correctly that Democrats were poised to take control of the New York statehouse. This began his lifelong political career as state senator, Assistant Secretary of the Navy, Governor of New York, vice-presidential candidate, Governor of New York and, ultimately, US President. FDR’s life history is one of the better known and studied among US presidents, and for good reason – the length of his presidency (12 years), his personal struggles with polio, his efforts to pull the US out of the Great Depression, his struggle to maintain neutrality in the face of mounting world crisis and, ultimately, his leadership in WWII all leave plenty of rich pickings for historians. FDR also had the good fortune of being in office just as broadcast radio emerged as a reliable and widespread communications medium, and he used it skillfully to take his message directly to the American people. For many Americans in the 1930s FDR was the first President they ever heard speak live, and through radio they heard him often. That high, nasal patrician voice gave comfort and reassurance to millions of Americans struggling to just survive. FDR was an extremely skilled politician, manipulator and chameleon. He played his audiences like a finely tuned musical instrument, and he was rarely off key. It has been said that an FDR appearance was like grand theater, and when you met him one-on-one and got the ‘full Roosevelt treatment’ you came away awed by the experience and the man. It also left historians with a treasure trove of radio broadcasts and newsreel footage with which to balance the often dry recitation of a presidential administration as evidenced by the paperwork it left behind. Unlike any President that came before, the modern media of radio and film allowed Americans to view the President as a human being, not a figurehead. Yet I am of two minds when it comes to the FDR as president. I greatly admire his foresight and leadership in WWII. His early (and probably illegal) efforts to skirt the US neutrality laws ensured that Britain survived until America’s entry into the war. FDR also brought the full weight of his political and diplomatic skills to bear on pre-1941 efforts to expand and modernize our armed forces in preparation to face what he saw was America’s inevitable involvement in WWII. I don’t think any other president could have done a better job. On the other hand, his undisciplined tinkering with the US economy and his administration’s abandonment of free market principles certainly extended the Great Depression. Everything his administration did between 1933 and 1940 only served to stifle US economic growth. Many economists today reluctantly admit that had Roosevelt simply left the economy alone and allowed the free markets to correct themselves the economy would have rebounded much faster than it did. In the end it took a world war to pull us out. FDR also kicked off an expansion of the federal government that continues unbridled to this day, although I’m sure he would be appalled at just how big, how far reaching, how intrusive and how liberal the government has become. But all this is neither here nor there in relation to today’s posting. Our lunch today reminded me of the the impressions FDR directly made on the State of Georgia. When you travel through west central Georgia, from just south of Atlanta to Columbus, you travel through FDR territory. The story of FDR’s legacy in Georgia is one of the fascinating back-stories of history. In 1921 FDR was struck down by polio. His search for a cure, or even moderate alleviation of his symptoms, led him to the resort of Warm Springs just outside of Pine Mountain in Georgia. At the time he discovered Warm Springs in 1926 it was a small resort that had seen better days. Using his personal fortune and political influence he built Warm Springs into a leading hydrotherapy treatment center (and it remains a leading paralysis treatment center to this day). But to FDR it became much more than just a place to find a cure. He fell in love with Warm Springs and the Pine Mountain area. It was a place where he could find relief from the pain and crippling effects of polio, where he could work his personal magic by encouraging fellow paralytics and where he could be himself without any pretensions. He wasn’t ‘Governor Roosevelt’ or ‘President Roosevelt’ to the hundreds of kids who came to Warm Springs for treatment. He was simply ‘Mr. Franklin’, a fellow polio victim who encouraged them, cajoled them, played with them in the pools, shared their joy when treatments worked, kept their spirits up when treatments failed. He helped pay for their therapy, sponsored parties and picnics, took them on drives through the countryside and up into the mountains. He was one of them, in body and spirit. Many observers noted that at Warm Springs FDR was truly himself. FDR was so in love with Warm Springs that in 1932 he built a cottage there that became known as the Little White House. This is where FDR stayed whenever he was in Warm Springs. Significantly, Eleanor Roosevelt hated the place and only visited once or twice. This meant that the Little White House became a place of solace and refuge for FDR. It is where he went to escape the pressures of the Presidency and WWII. FDR’s Little White House, and it is little! Three small bedrooms, a small kitchen and a living room, but a wonderful porch with a great view. It is amazing to think FDR would run the country from this small cottage for weeks at a time. But FDR did more than just drop in to Warm Springs and the Little White House for treatment. He was too much of a politician to just soak in a pool for a few hours. He needed to get out and get around, see what the people are doing, get their stories. He had a compulsive need to press the flesh. And he did it from the driver’s seat of his car. FDR would roam Meriwether County, driving his specially modified Ford. He would stop and talk to local farmers, sharecroppers, laborers, store keepers, politicians, anyone who wanted to chat. White or black, it didn’t matter. He would listen to their problems, issues and concerns, and he turned much of what he learned from those conversations into programs through New Deal legislation. FDR’s roamings were so extensive that even today it is easy to find people around Pine Mountain and Warm Springs who remember being held up by their parents as they chatted with the President or climbed on the running boards of his car as he stopped in town. It seems at one time or another about half the residents of Meriwether County claimed to have spoken with, had lunch with or had a drink with Franklin Delano Roosevelt. Recently I went fishing with a group of friends on the Flint River which runs close to Warm Springs. Our guide told us the story of his grandfather, a county official back in the late 1930s, who was out with a road maintenance crew one day when FDR, driving alone, raced up to the group and came to a sudden stop. “Jack, is that you? Jack, I’m looking for some whiskey and I know you can tell me where to find some!” Jack, our guide’s grandfather, had met FDR during some of his previous outings and gave the President quick direction to a local moonshiner’s house. As FDR pulled away he gave a wave and with the characteristic FDR grin shouted, “Boys, I’d like to stay and chat, but my Secret Service detail is right behind me and I don’t want them to know what I’m up to!” And with that the President of the United States sped off down the road in search of illegal whiskey. Moments later a convertible full of Secret Service agents raced by as the maintenance crew pointed down the road in the direction they sent the President. A true story? Who knows, but it reflects the relationship the region had with the 32nd President – a rich and powerful yet friendly and unpretentious character who needed Warm Springs as much as the town and region needed him. The two came to love each other, and Warm Springs and Pine Mountain claimed FDR as one of their own. While the Pine Mountain region is rich with stories of FDR, he also left a physical legacy. First and most important is the Roosevelt Warm Springs Institute for Rehabilitation. The institute continues to operate today, providing treatment and support for up to 5,000 patients a year. Next is the Little White House. When Roberta and I visited it a few years ago I was very surprised to learn that the Little White House and surrounding grounds are not part of the National Park system. The property is owned by the Warm Springs Institute and is run by the Georgia Department of Natural Resources. The Warm Springs Institute maintains the house as it looked the day FDR died. It is easy to see why FDR loved it so much – it is a small and unpretentious structure, comfortable and comforting. 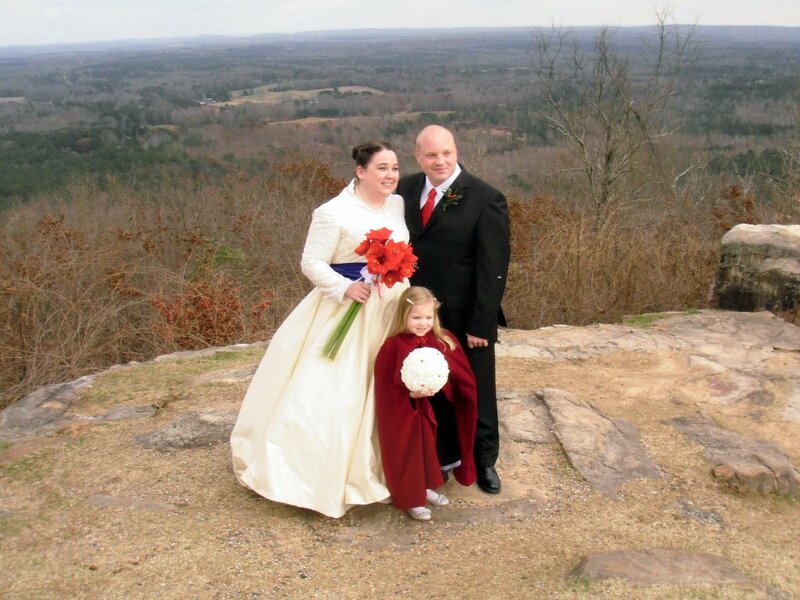 Even more personal for our family is a location called Dowdell’s Knob on Pine Mountain. The knob offers a beautiful view into the King’s Gap region of Pine Mountain, and the location was one of FDR’s favorites. It became his favorite picnic spot and he had a stone picnic grill built there for his personal use. Dowdell’s Knob is also one of the last places FDR visited, stopping there just two days before his death to spend some quiet moments alone before heading back to the Little White House and the war business that awaited. Dowdell’s Knob is so charming and has such an intimate connection with FDR that our daughter Elizabeth chose it as the site of her wedding last December. 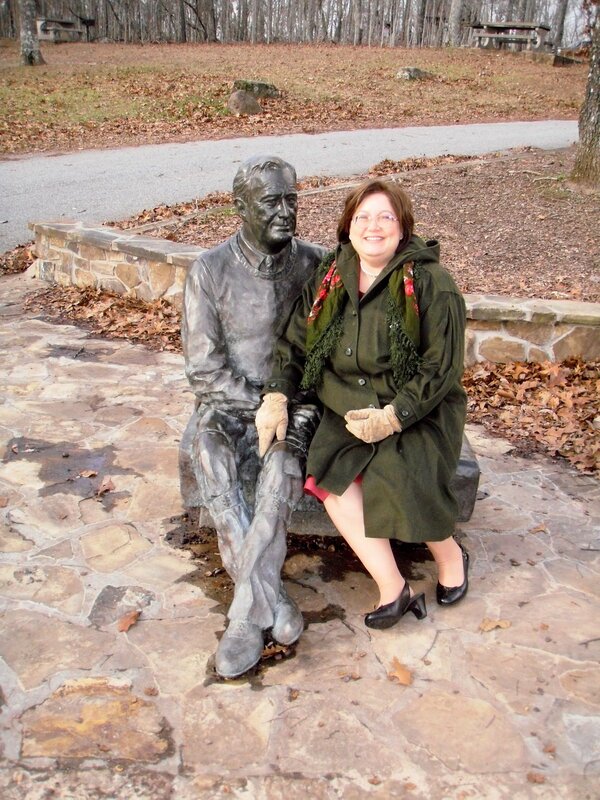 The State of Georgia commissioned a sculpture of FDR to be placed at Dowdell’s Knob, and the artist did a wonderful job of creating an intimate portrait of the man as he was when visiting his favorite spot – comfortable, causal and accessible. The Mother Of The Bride spending a few moments with Franklin at Dowdell’s Knob. Watch that hand! I like to think that FDR was there in spirit on the day our daughter was married, sitting in his car, cigarette holder in his mouth, his old comfortable Navy cape around his shoulders, grinning the famous FDR grin as the family gathered by his picnic grill to celebrate. He certainly would have been a welcome presence, since this was his Warm Springs, his Georgia. This entry was posted in General, History and tagged franklin roosevelt by Brian Haren. Bookmark the permalink.